GABARRON infrared radiators transform 100% of its power in heat in less than one second, it does not require any type of pre-heating and the result is a very important energy saving. Space volumes are not heated, only direct areas and only when it is required. Heat is produced by means of a short infrared wave maximized due to a special parabolic design in its reflector. Heat is focused on people and objects in a concentrate and homogeneous way. Infrared radiators are a good form of heating for anyone who needs an easily installed heating system. These models need no building work whatsoever, as well as being very economical to buy and run. Their main feature is the way they provide heat. Infrared radiators warm people, not the air. 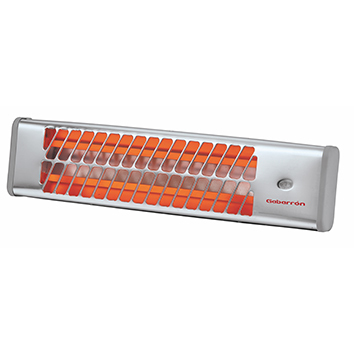 These efficient sun-like heaters can penetrate damp air with minimum heat loss to the atmosphere. Efficient, compact and light-weight, we offer you ideal appliances for industrial, commercial and home locations where space is limited.